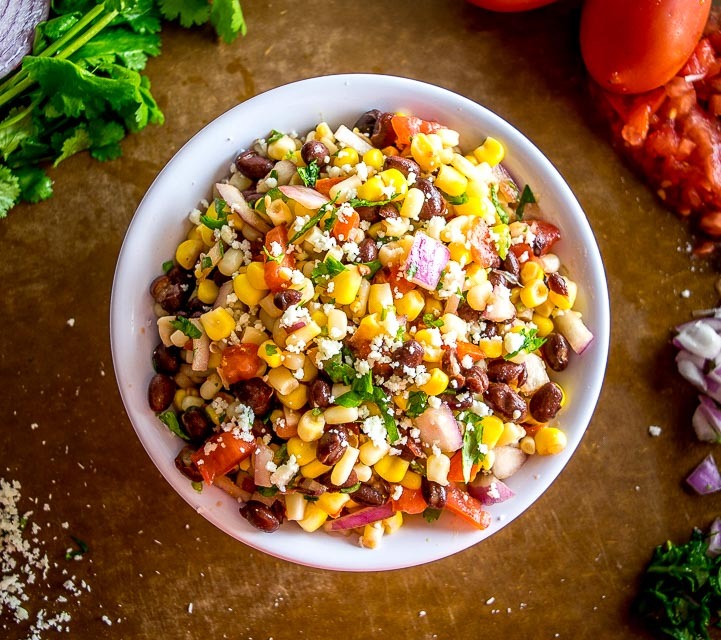 This wildly versatile Black Bean and Corn Salsa will have you dreaming up all sorts of ways to use it: tacos, burritos, breakfast backup?!! And you can easily turn it into a meal with a few additions so it’s worth keeping it in mind if your kitchen needs a kickstart. I think it tastes best when accompanied by a pop of lime flavor so definitely keep a lime on standby for a final squeeze! You might get a slight upgrade if you have access to fresh corn but I think it’s worth making this pantry version at some point; it’s just as good and it comes with the added benefit of being accessible year round. Keep in mind that you can always add in the other half can of beans if you want a more hearty version. Give it a good mix and just like that you’re already on the verge of a tried and tested flavor combo. Of course, I find it hard to not add a bit of smoky chipotle to this mixture so we’ll add 1 tablespoon of adobo sauce, but you can consider this optional. Using a full jalapeno and the tablespoon of adobo sauce will give it a palpable heat but feel free to dial back and use 1/2 jalapeno for a milder version. 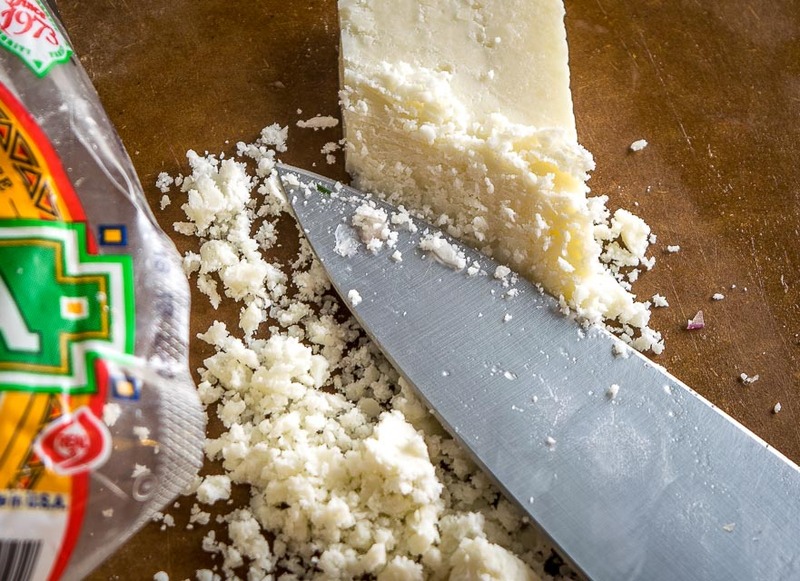 It’s also worth trying this salsa with a generous sprinkling of sharp, salty Cotija cheese. If you’re new to Cotija we have more info on it here. I find it easiest to slice off a chunk of Cotija and then pull across it with the flat part of the knife; it should crumble quite easily. Combine well and take another taste for seasoning and lime. I added another pinch of salt and a final squeeze of lime to this batch. If all went according to plan you’ve got the lauded bean-corn flavor combo as the main attraction but heavily supported by a burst of spicy limey salty goodness. 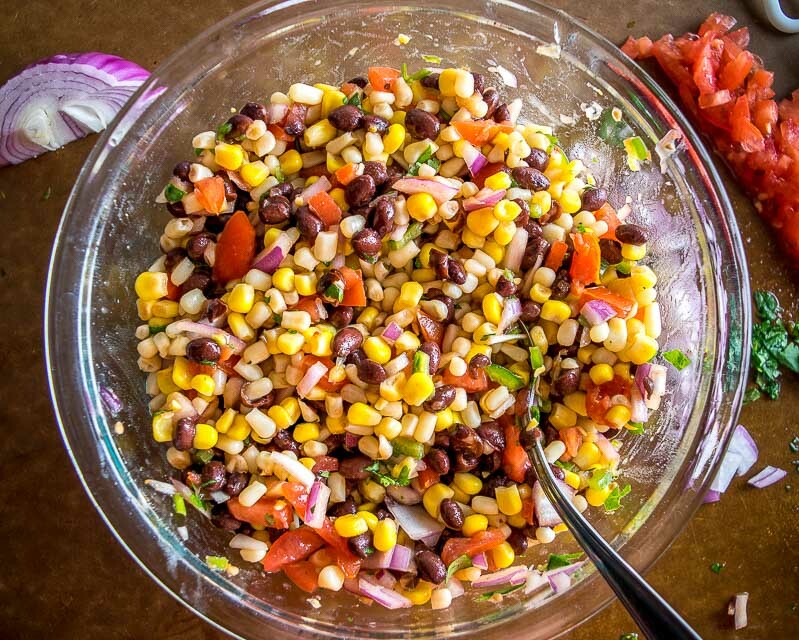 You can use this Black Bean and Corn Salsa in all sorts of dishes. I typically make a big batch and then use it to whip up tacos on the fly. Melt some cheese in a tortilla, add the salsa and some avocado bits and you’ve got an instant meal. 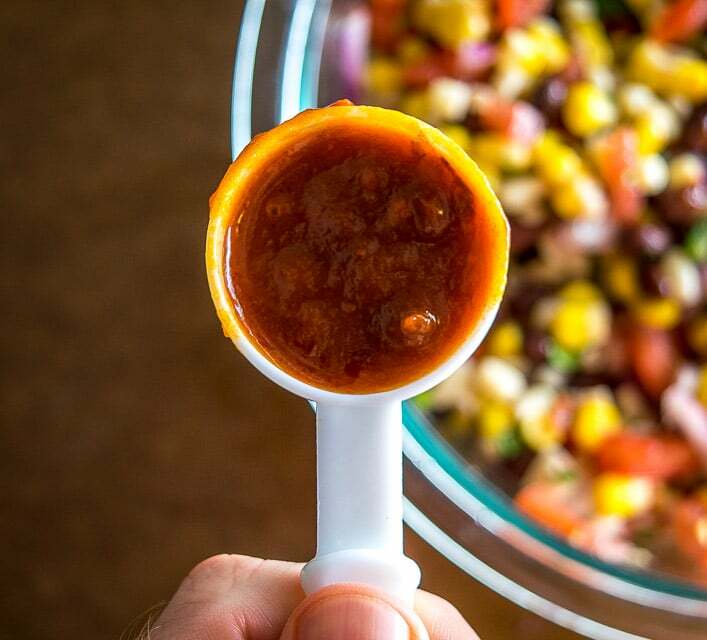 And while it’s technically called a salsa, it comes with the added benefit of being the perfect foundation for an epic taco salad. Add some chopped romaine along with some chunks of protein and dinner is served. I’ll put up a detailed recipe for this at some point. 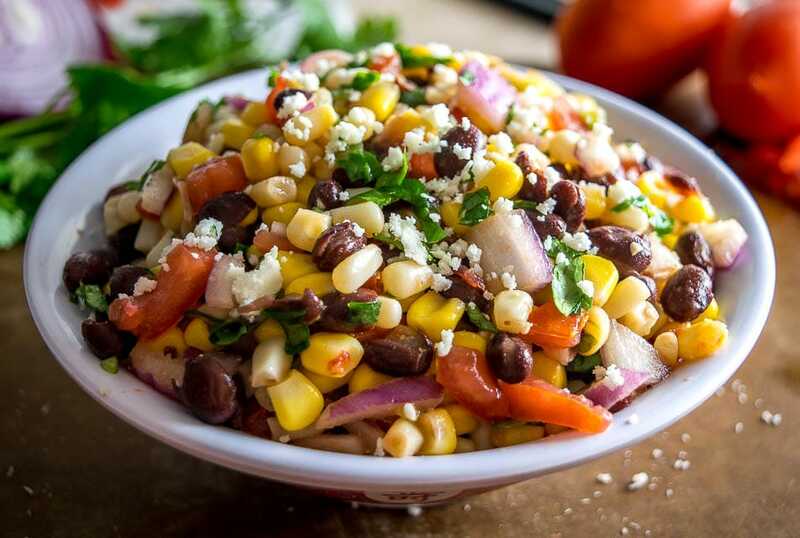 Okay, don’t forget to keep some lime on standby as I find that a final burst of acidity really makes this Black Bean and Corn Salsa come alive! 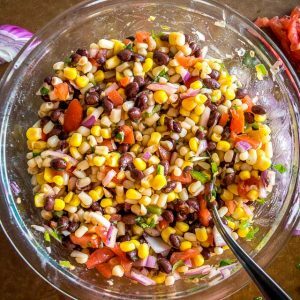 This wildly versatile Black Bean and Corn Salsa will have you dreaming up all sorts of ways to use it: tacos, salads, even wraps! I think it tastes best when the lime flavor is at the forefront so feel free to add another squeeze! 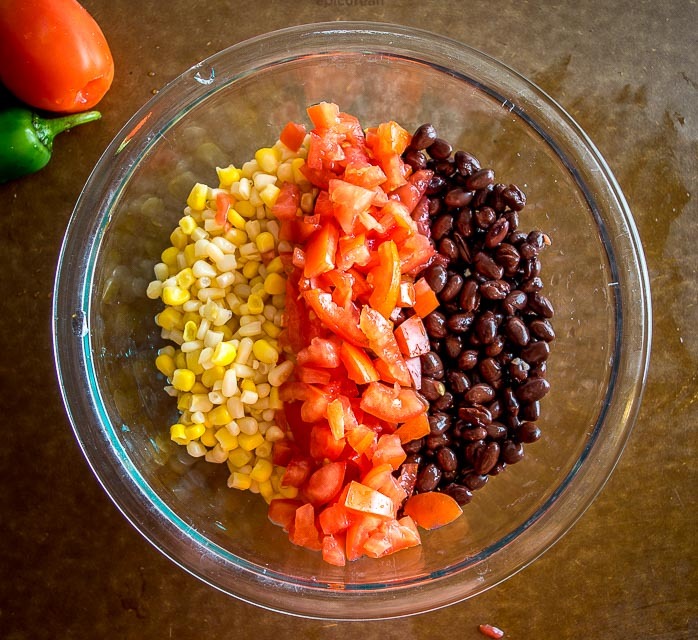 Drain and rinse the corn and black beans, adding them to a mixing bowl. Note that we're only using 1/2 can of black beans in this version. Finely chop the 3 tomatoes, 1/2 red onion, 1 jalapeno, and 12-15 cilantro sprigs; adding them to the mixing bowl. I usually twist off and discard the thicker, bottom portion of the cilantro stems but keep the upper stems. Add the juice of 2 limes, 1 tablespoon adobo sauce, and 1 teaspoon salt. Combine well and take a final taste for seasoning, adding more salt or lime if necessary. 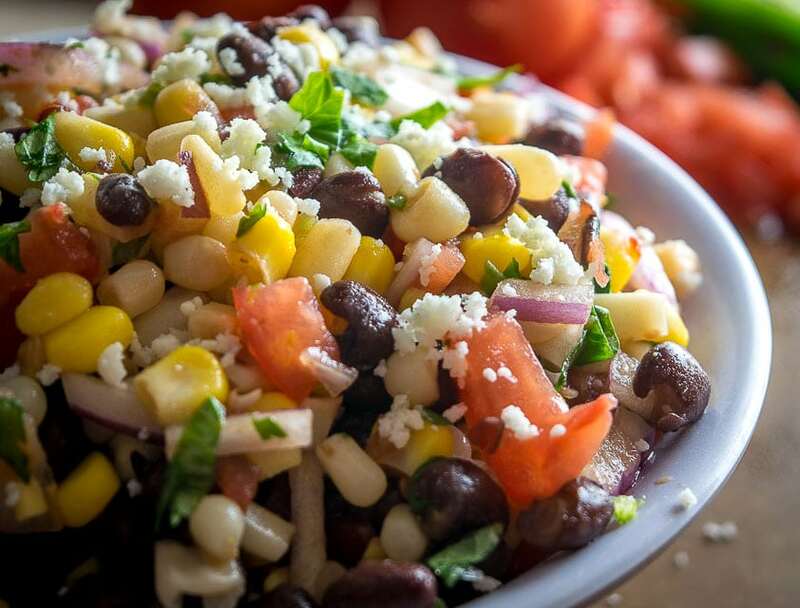 Garnish with a generous sprinkling of Cotija cheese. Serve immediately or store in an airtight container in the fridge. I like this salsa best when using a 2:1 corn to beans ratio, but you can always make a more hearty version by adding in more beans. A final burst of acidity works really well with this salsa so definitely keep some lime wedges on standby. Alternative sources of acidity would be red wine vinegar or hot sauce. Assuming a 15 oz. can, one can of corn is approximately 2 cups worth of corn. 1/2 can of beans is approximately 1 cup of beans. 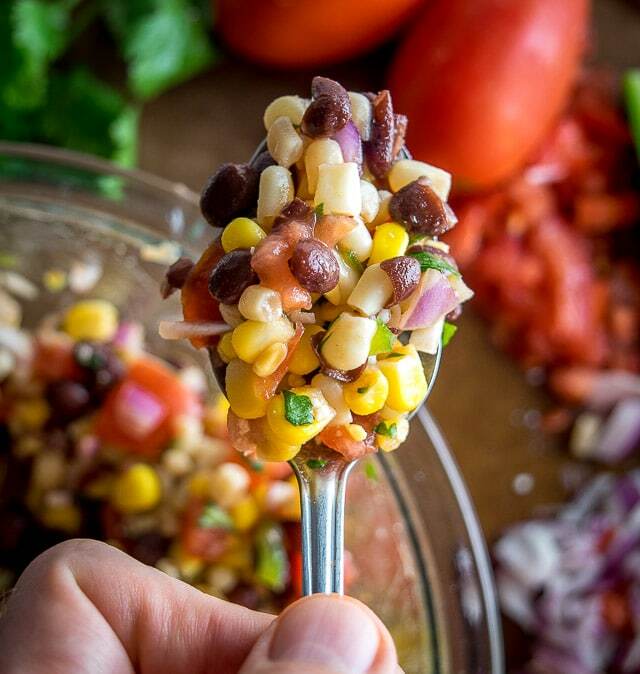 I just made this black bean , corn salsa tonite. Enough for 3-4 Days, we shredded some ghost pepper jack cheese for on top, what an extremely refreshing side dish, plan on using it with eggs for breakfast also, this is an easy dish to whip up, everyone at our home enjoys it . Thanks! Yowsa sounds awesome with a bit of that cheese on top. Thanks much for the feedback Scott, I’m glad the home is enjoying it! OMG!! This recipe is absolutely delicious. Thank you so much. My family and I loved it. I will making more. You could never get tired of this. The leftovers we used for breakfast with eggs and tortillas. Thanks Julia! I’m the same, I find all sorts of uses for the leftovers. Cheers. This is very good. You can add a couple types of beans, or grains; I like cooked Farro in it. Try adding; one avocado blended with a little avocado oil, 1 tb apple cider vinegar, 1 tb honey in a blender (also makes marvelous “mayonase”!). Summer time, char fresh corn, onion on the grill for new flavor profiles. BUT DO NOT FORGET THE AVOCADO MAYONAISE! How do you feel about freezing this in portions? Hey Randall! Hmmm I haven’t tried freezing this and I’m not sold on it working out too well. Beans seem to freeze well but I think the other high moisture ingredients risk coming out a little mushy.